Hull the strawberries and put in a food processor with the sugar. Pulse several times to make a rough purée, with a few chunky bits to add texture to the ice cream. Add the crème fraîche into the processor and pulse a few times to combine. Pour the mixture into a metal loaf pan and cover with a sheet of aluminum foil. Freeze until the ice cream is firm around the edges of the pan, about 1-2 hrs. Remove from the freezer and stir the mixture to break down the ice crystals. Return to the freezer for 1 hr longer, then stir again. Return to the freezer until fully frozen. 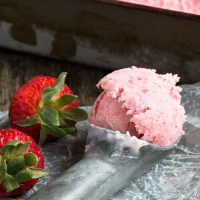 To serve, remove the ice cream to the freezer for about 15-20 minutes before serving, so it is soft enough to scoop.